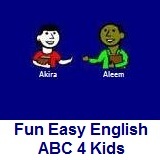 ﻿ Fun Easy English - new writing english alphabet for kids letter i. Hey kids, try writing the letter I.
I like to eat ice cream. A ladybug is an insect. There is ink in the pen.